As educators and parents, we’ve all been there. Gas is passed and a variety of snickers, giggles, and negative comments ensue. But did you know that everyone and every living thing (except jelly fish and coral sponges) passes gas? If it’s so natural, and so common, why do we struggle with teaching children how to respond appropriately when It happens? 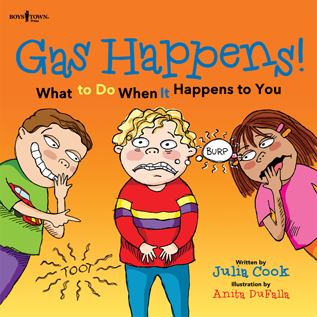 This book will have children and adults in stitches as you read the hilarious tale of Gus, the student who passes gas in class. Join Gus as he and his classmates learn the brief biology lesson behind why we all pass gas, and the right way and the wrong way to handle it when it happens in public. This book is an excellent way for students to learn about a subject that ‘happens’ to everyone! Thank you, Julia, for giving us another wonderful story to help teach the tough stuff!